A previously-used Falcon 9 booster soared to life at California’s Vandenberg Air Force Base on Sunday for its Static Fire test ahead of lifting the fifth set of Iridium-NEXT communications satellites on Thursday, marking the start of a string of Falcon 9 missions lined up for March and April. 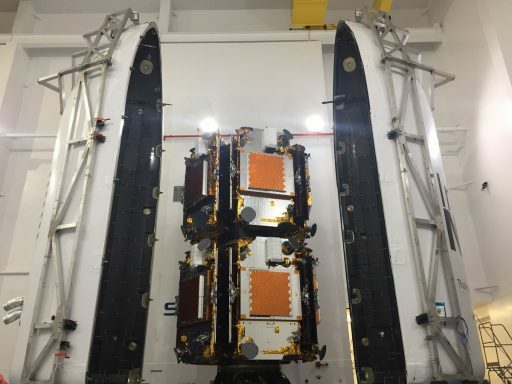 Liftoff is targeting 14:19 UTC on March 29 to boost the number of Iridium-NEXT satellites in orbit to 50 as the Virginia-based communications company continues pushing toward having the full Iridium-NEXT constellation in operation by the end of summer. Sunday’s Static Fire test occurred near the opening of the day’s test window at 7 a.m. and was expected to run for seven seconds to exercise the nine previously-flown Merlin 1D engines of Booster 1041, gearing up for its second Low Earth Orbit mission. The booster was first in action for the third Iridium-NEXT mission in October 2017 and successfully returned via a Drone Ship landing in the Pacific Ocean as SpaceX has yet to conduct its first return-to-launch-site recovery from Vandenberg. Thursday’s launch will mark SpaceX’s sixth of the year, the fifth with Falcon 9 and the third Falcon 9 mission with a used first stage. It is to be followed by a series of Falcon 9 missions out of Florida with a Dragon resupply craft set to begin its trip to the International Space Station on April 2nd, NASA’s TESS exoplanet hunter is aiming for a minute-long launch window on the 16th and the Bangabandhu-1 and SES 12 satellites are set for Geotransfer deliveries at some point in April if the manifest stands. Having crossed the halfway point with December’s Iridium-4 mission, Thursday’s launch of ten constellation members will reach the two-thirds mark with 50 satellites in orbit and 25 left on the ground, set to be launched by the end of August via two dedicated Falcon 9 missions and a shared ride between five Iridiums and two GRACE-FO gravity-sensing satellites. 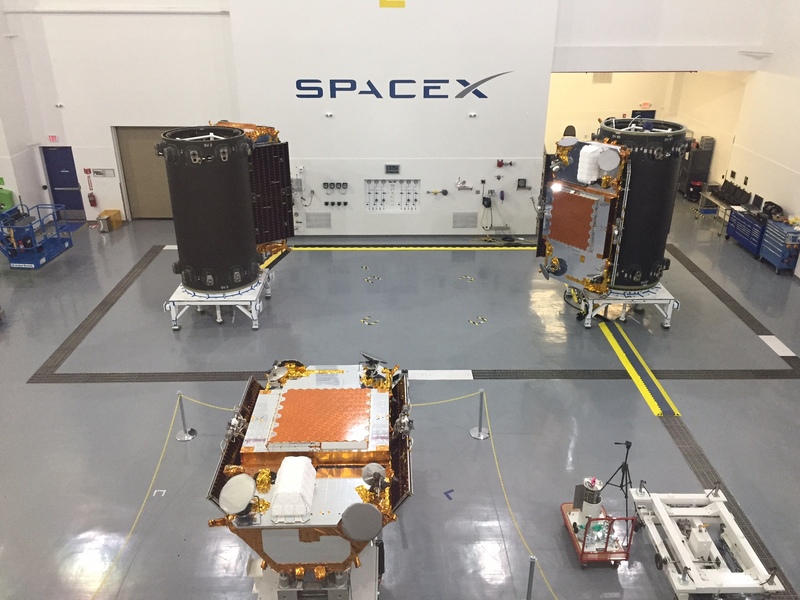 The shared mission had been scheduled for April 28 while Iridium-7 was looking at a June launch target; however, these dates have recently been placed under review with a likelihood of moving to the right. 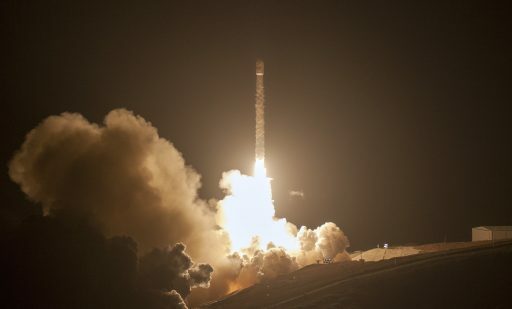 The replacement of the entire first generation Iridium fleet with much-improved Iridium-NEXT satellites is the most extensive constellation upgrade ever performed – coming with a price tag near $3 billion and requiring an assembly-line style satellite integration architecture to keep up the pace needed for sending 75 satellites into orbit in a period of only one and a half years. 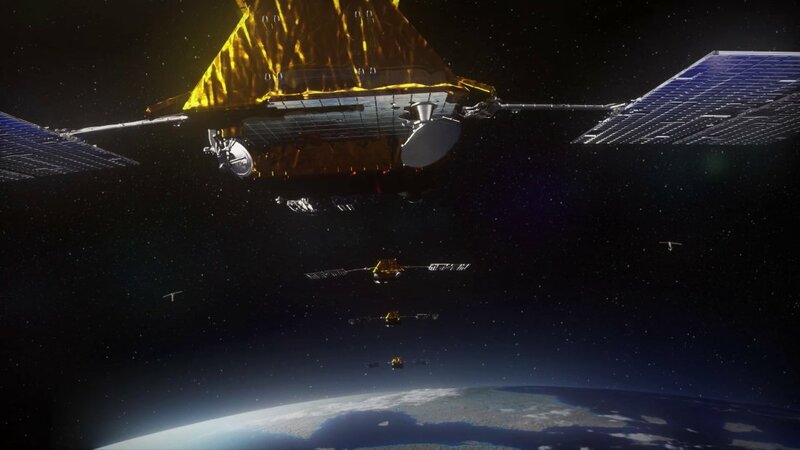 The original Iridium constellation began deployment in May 1997 and, at operational strength, consists of 66 active satellites in six orbital planes at an altitude of 780 Kilometers plus operational spares to replace satellites in case of problems. Carefully spaced in their orbital planes, the Iridium satellites communicate with user terminals on the ground and route communications packages to their destinations through satellite-to-satellite links between members of each plane and satellites in neighboring planes. Given its low altitude and high inclination, Iridium is the only constellation currently in operation that can offer truly global coverage (including the poles that are difficult to serve from Geostationary Orbit). 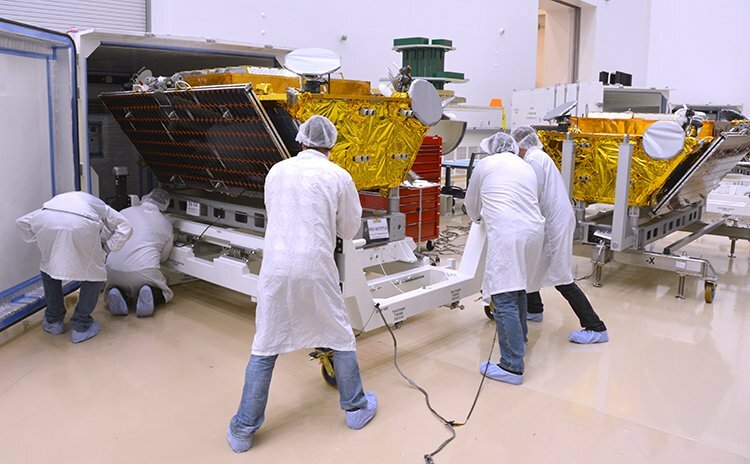 Built by Thales Alenia and integrated by Orbital ATK, each Iridium-NEXT satellite weighs 860 Kilograms and covers a 4,700-Kilometer wide footprint – connecting to user terminals through a large L-Band antenna. 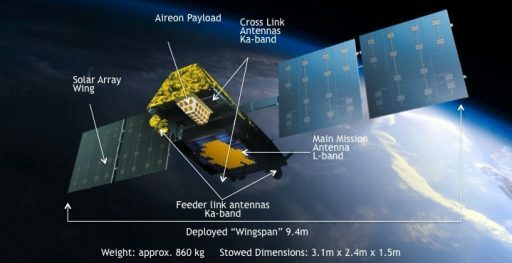 Typical services offered by Iridium-NEXT are voice and data communications with mobile terminals at up to 1.5Mbit/s while a high-speed Ka-Band service is available for larger fixed and transportable terminals at data rates up to 8Mbit/s. Thursday’s launch will likely be the final mission for Block 4 Booster 1041 if SpaceX follows a recent pattern of expending boosters not deemed suitable for more than two flights. The booster rolled off the production line at SpaceX HQ in Hawthorne last summer and went through acceptance testing at the company’s McGregor, Texas facility in September before shipment to Vandenberg to meet its Block 4 second stage for a Static Fire Test and integration with the ten Iridium satellites. It lifted off before sunrise on October 9, 2017 and played an active role in the third Iridium delivery for 144 seconds before separating from the second stage and mastering a nighttime landing on the “Just Read The Instructions” Drone Ship. 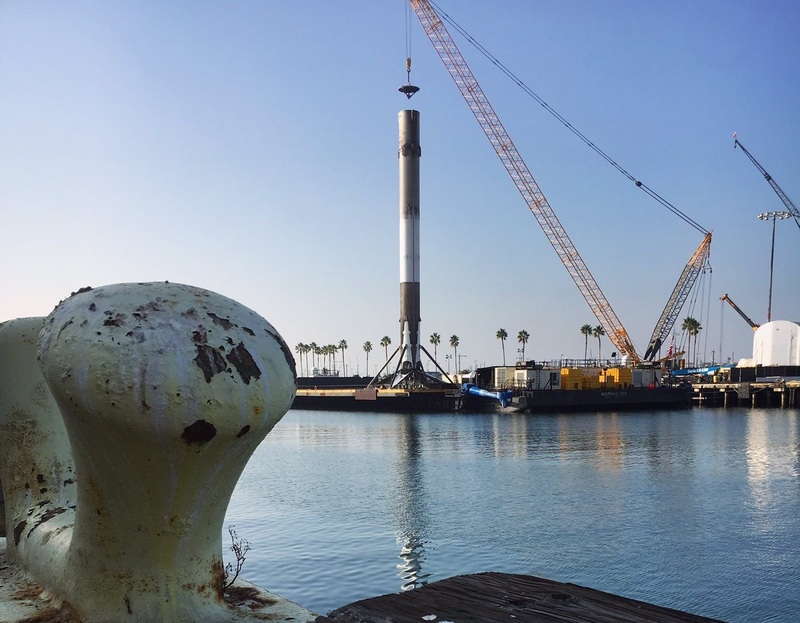 Returning to land via the Port of Los Angeles, the sooty booster went through refurbishment in Hawthorne, including non-invasive inspections on its nine engines and welds as well as the replacement of some thermal protection material around the engine section. It departed Hawthorne in late February to enter its second Vandenberg processing campaign – meeting a factory-new second stage before rolling out to the SLC-4E launch pad. Falcon 9 was spotted on the launch pad on Saturday and entered a lengthy countdown under a veil of darkness as Sunday’s test window opened just moments after sunrise at the Pacific-side launch complex. Tanking began at the T-70-minute mark when Kerosene began flowing into the two-stage rocket followed at T-35 minutes by the expedited Liquid Oxygen tanking sequence designed to load the sub-cooled oxidizer as close to T-0 as possible to prevent it from warming excessively. Although the second stage is only a bystander in the brief ignition of the booster, it also goes through a complete tanking and pressurization cycle to put its systems through integrity checks as they would occur on launch day. Standing fully loaded with over 500 metric tons of propellant, Falcon 9 was to be handed control at the T-1 minute mark to oversee the countdown to ignition of the nine Merlin 1D engines. For missions employing a new booster, SpaceX deems a 3.5-second firing sufficient to check the start-up parameters of the engines while used boosters fire for seven seconds to collect additional data with all engines running at their operational thrust. After going through an orderly shutdown, Falcon 9 was to be safed while engineering teams went through a quick-look review to a) ensure the firing met its planned duration and b) verify all required performance parameters were captured to head into deeper reviews. 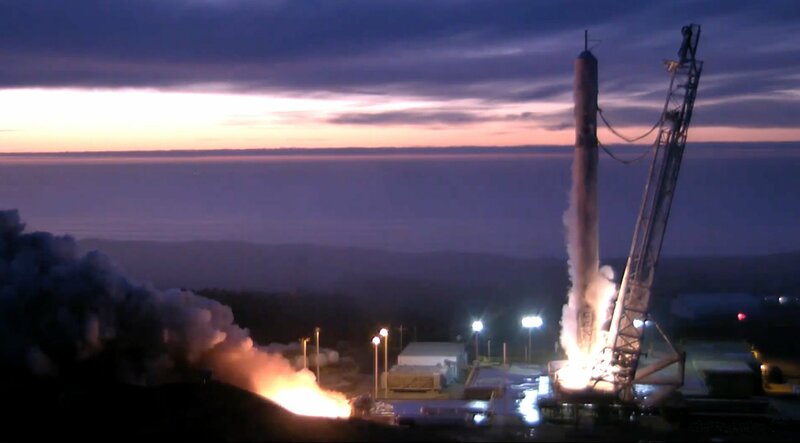 SpaceX confirmed the successful completion of the Static Fire test via Twitter, indicating all initial reviews were nominal – also confirming the March 29 launch target. After safing steps, propellants were to be drained from both stages in preparation for the rocket’s return to the Horizontal Integration Facility for the installation of the payloads on Monday and Tuesday. The fifth Iridium set began shipment to Vandenberg on February 23, one day after the Falcon 9 with Spain’s PAZ satellite vacated the launch pad. Arriving at the launch site, the satellites went through final checks before taking their slots around the two-tier launch adapter and receiving maneuvering propellant for their missions. Once the encapsulated stack is attached to Falcon 9, the fully integrated launch vehicle will be cleared for rollout – provided a green-light is given by the upcoming Launch Readiness Review. Liftoff on Thursday is targeting 14:19 UTC, 7:19 a.m. local time, just under half an hour after sunrise, and the mission will follow the typical Iridium ascent profile comprising two second stage burns for deployment of the ten satellites into a 625-Kilometer orbit by T+72 minutes.